Gigantic beings are a common staple of Greek mythology, and although often dangerous opponents for heroes and gods to overcome, like Typhon, some, like the Hecatonchires, could also be allies of the same heroes and gods. In Greek mythology there was though a group of giants that were definitely the enemies of the gods, this group was the Gigantes, who rose up against the rule of Zeus in the Gigantomachy. The Gigantes were the offspring of Gaia, the Greek goddess of the Earth, born to the goddess when the blood of the castrated Ouranos fell upon her, giving the Gigantes a manner of birth similar to the Erinyes (the Furies). ​Nominally there was said to have been 100 Gigantes born to Gaia, each said to have been born fully armoured, and with weapons in their hands. Whilst generally considered human like in appearance, and giant in nature, possibly standing five metres tall, others state that the Gigantes were not gigantic, but simply men with enormous strength. The place of their birth is variously given as Arcadia, Campania, Sicily and the Phlegra Plain. The latter is normally associated with the Pallene peninsula of ancient Thrace, and certainly it was here that the Gigantes were normally said to reside. On the Pallene, the Gigantes were ruled by Eurymedon, the king of the Gigantes. The Gigantes were said to be troublesome from birth, and some ancient sources tell of them aiding the Titans during the Titanomachy, although it was common in later mythology to confuse the Titans and Gigantes as the same group of mythological characters. After the Titanomachy the Gigante Alyconeus was blamed for the theft of the sacred cattle of Helios, the Greek god of the Sun. The troublesome nature of the Gigantes would come to the fore when they went to war with the gods of Mount Olympus in a war known as the Gigantomachy (War of the Gigantes). The cause of the war though was not just the troublesome nature of the Gigantes, but also due to the intrigue of Gaia, the mother of the Gigantes. 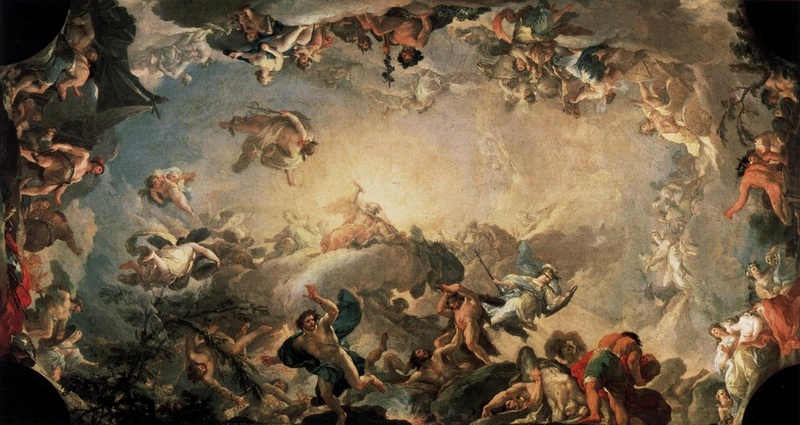 Gaia had previously helped Zeus during the Titanomachy for it allowed her children, the Hecatonchires and Cyclopes to be released from their imprisonment in Tartarus. After the war though, these children of Gaia, had been replaced by other children, and grandchildren of the goddess, when the male Titans had been imprisoned there. Thus, Gaia plotted to bring about the downfall of Zeus, and thus set to work rousing up the Gigantes. Even before could erupt though, prophecies were being recounted, and Zeus was informed that he could not win without a mortal fighting on his side. Zeus of course had the perfect mortal in mind for the war, his own son Heracles. Gaia though also found out about the prophecy, and soon gained knowledge of herb that would make the Gigantes impervious to the attacks of any mortals. Before Gaia could collect the herb and give it to the Gigantes, Zeus had darkened the entire earth, and stole away the herb. When war did erupt 100 Gigantes faced off against the 12 gods of Mount Olympus, who were only aided by the Moirai (the Fates) and Nike (Victory). Zeus was not guaranteed success, and it was said that the battles during the war were fiercely fought, and also evenly balanced, and it was even said that Hephaestus came close to being killed. 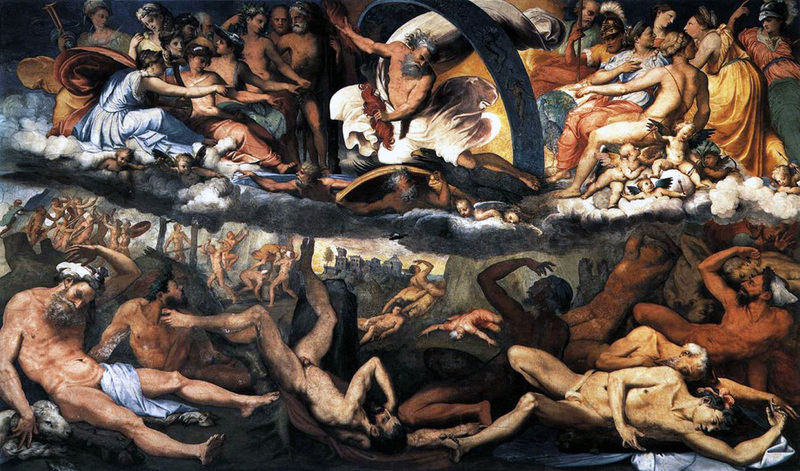 There were many individual battles of note during the Gigantomachy. Probably the most famous battle of the Gigantomachy took place between Heracles and the Gigante Alcyoneus upon the Pallene. Rather than undertake a battle of strength, Heracles unleashed his arrows upon the giant, for his arrows were dipped in the poison that was the blood of the Lernaean Hydra. The arrows caused Alcyoneus to fall down dead, but as soon as hit the ground of the Pellene, the Gigante was instantly revived; for Alyconeus was immortal whilst he remained on his homeland. Heracles’ solution to the problem was extremely simple, for Heracles simply dragged Alcyoneus off of the Pallene, and thus killing the Gigante proved to be a simply affair. The second strongest of the Gigantes was Porphyrion, and again it was Heracles who faced this giant, although Heracles was assisted in the fight by his father Zeus. As the opponents faced each, Hera was used as a distraction, and whilst Porphyrion lusted after the goddess, Heracles unleashed his arrows, and Zeus threw down his thunderbolts, killing Porphyrion where he stood. Aphrodite and Heracles would work together to kill several Gigantes, for the Greek goddess of Beauty, would lure lustful Gigantes to come to her, whilst Heracles laid in wait for them. It was said that Leon, a lion headed Gigante, was killed in this manner. Heracles of course did not do all the killing in the Gigantomachy, and the Olympian gods and goddesses also fought the Gigantes. Poseidon would crush Polybotes by placing the volcanic island of Nisyros upon him, and a similar fate awaited Enceladus when the goddess Athena placed Sicily upon the Gigantes. The Gigante Pallas was also killed by Athena, and Mylinus was killed by Zeus. The goddess Artemis was said to have struck down Gration with her arrows, Hermes killed Hippolytus with his sword, Ares killed Mimon, Hera killed Phoetius and Hephaestus poured molten metal from his forge to kill Mimas. Ephialtes was killed by Apollo and Heracles when each shot an arrow into one of its eyes. Hecate would use burning torches to set Clytius alight, whilst Helios would kill Molios. The Greek god Dionysus was also a prominent figure in the Gigantomachy for many of the Gigantes would attack him, and Dionysus was said to have killed Typhoeus and Eurytus. The Moirai, the Fates, would also play their part in the war against the Gigantes, and through the use of bronze clubs, the Gigantes Agrius and Thoon were killed. The Gigantomachy was said to have resulted in the demise of the Gigantes, although stories tell of the survival of two. The Gigante Aristaeus was hidden away by Gaia, who transformed him into a dung beetle to disguise him. Also, when Syceus fled to Cilicia, Gaia transformed him into a fig-tree. It was not just the intrigue of Gaia that was involved in the Gigantomachy, as the Gigantes were also being manipulated by the goddess Hera as well; for Hera saw it as an opportunity to kill Dionysus, the illegitimate son of Hera. Hera would therefore entice various Gigantes to fight Dionysus, promising much if they were successful. Hera promised Aphrodite to Chthonius, and Hebe to Porphyrion if they were successful, and Peloreus was also urged on by Hera. It was another illegitimate son of Zeus, and enemy of Hera, who gained most from the Gigantomachy, for Heracles gained great honour from his role in the war, but even more importantly, Heracles was also promised immortality, and upon his death he would become one of the gods of Mount Olympus, as well as its physical protector. There were plenty of other Giants who appeared in Greek mythology, and sometimes additional giants are named as Gigantes, although their parents are never Ouranos and Gaia. Polyphonte was an attendant of Artemis turned mad by Aphrodite, and as a result she mated with a bear, giving birth to two giants, Agrius and Orius. Agrius and Orius were despised by Zeus, who sent Hermes to punish them. Before Hermes could torture Agrius and Orius, Ares, who was an ancestor of Polyphonte, intervened, and so Hermes and Ares transformed the two giants and Polyphonte into birds. Polyphonte became a small owl, Agrius was transformed into a vulture, and Orius into an Eagle Owl. The story of the Aloadae would in later mythology be included in the battles of the Gigantomachy, although events surrounding Ephialtes and Otus occurred at a different time. Ephialtes and Otus were the gigantic sons of Poseidon and Iphimedia who sought to storm Mount Olympus in order to make Artemis and Hera their wives. The twins would pile mountains on top of each other in order to reach the heavens, but ultimately the pair would kill each other through the intrigue and transformation of Artemis. Alebion and Bergion were sons of Poseidon who were encountered by Heracles, although again not during the Gigantomachy, but at a time when Heracles had just finished his tenth labour.